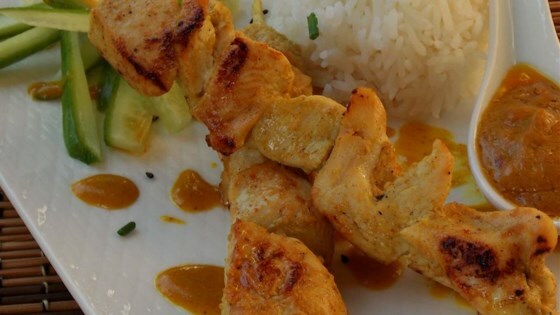 "Flavorful Thai-style chicken skewers are topped with a sweet and spicy peanut sauce. Serve with white rice for a complete meal!" Grilled chicken kabobs with Greek-inspired flavors and cucumber yogurt sauce. not quite as flavorful as I expected with all the effort put in. All in all, it was good. Very good. The peanut sauce is divine. I grilled the chicken using metal skewers. Don't over cook the chicken as it will get dry. Nice balance of spice and peanut taste. I served it with Jasmine rice and thai cucumber salad. I will definitely make this again. Even my picky seven year old loved it. Very, very good. I added a teaspoon of sambal (chili garlic paste) to add a little more spice. We really enjoyed this. Thanks! Simple directions and great flavor! I used the broiler. Yummy! Brilliant! The only other thing I did was to soak the wooden skewers in cold water to stop them burning. I also left the chicken in the fridge over night. Lovely flavour.